This week’s release of iOS 10.2 saw a number of changes to Apple’s mobile operating system, as well as some tweaks to the iOS Music app. In this week’s column, I tell you what’s changed, so you can be up to date: I explain the new way to sort albums and songs by artist or title, and I show you how you can (finally) rate your songs again on your iPhone or iPad. I then answer a question about music disappearing from the iTunes Store, and discuss what to do if you’re tired of renting music from Apple. Q: I just updated my iPhone to iOS 10.2, and there isn’t an option to sort music in the Settings. How do I alphabetize my music by song title now? When iOS 10 was released, Apple made a number of changes to the Music app. One of these changes affected the way songs and albums sorted when viewed in the app. I explained how to change the sort order in an Ask the iTunes Guy column back in September. The release of iOS 10.2 this week has changed this again. You still have the same options, but the way you apply them is different. This time, the change is positive, since you can now access this setting directly from the Music app. When you view your music by Songs or Albums, you’ll notice the word Sort at the top right of the screen. Tap this to display a menu, which then allows you to choose which criteria you prefer. 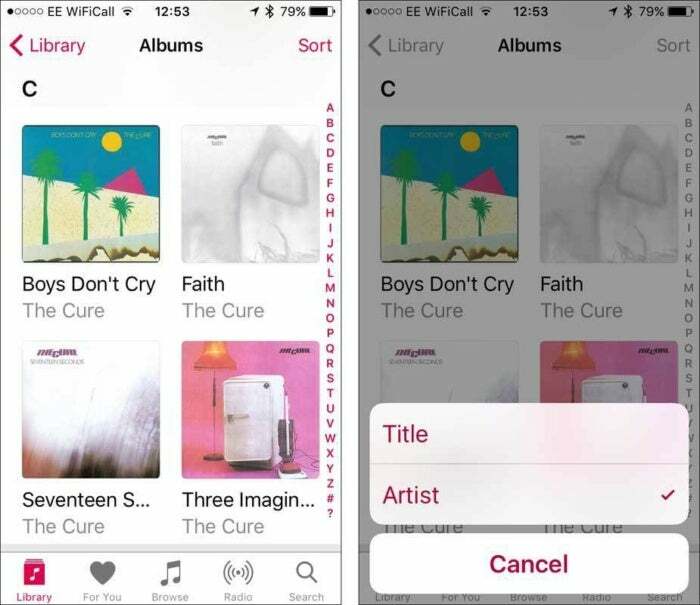 Tap Sort, then tap Title or Artist to choose how songs or albums display. Note that this is no longer a global setting; you can have, say, albums sort by title and songs sort by artist. Rate your songs again in the iOS Music app. Q: I’d heard that I would be able to rate my songs again in the Music app in iOS 10.2. How can I do this? Star ratings have indeed returned to the iOS Music app. But it’s a bit tricky to find them. You first need to go to the Settings app, then the Music settings, and toggle Show Star Ratings. Next, to rate a song, start playing the song, tap the ... button at the bottom right of the display, then tap Rate Song in the menu that displays. 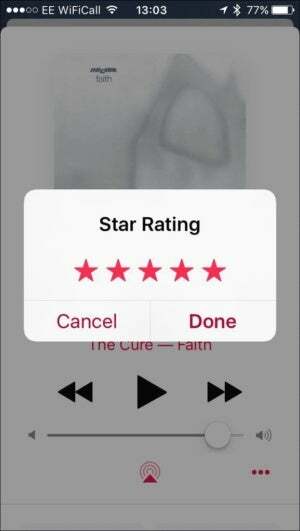 In the dialog that pops up, tap a rating (from left to right, these are one to five stars), then tap Done. You can also rate a song that you’re not currently playing. Tap and hold a song name, and you’ll see the same menu that offers a Rate Song option. Q: I recently realized that I no longer have a song that I bought from the iTunes Store several years ago on my iPhone, or in my iTunes library. When I search the iTunes store, the song and album are not even there anymore. Can Apple just randomly delete purchased music? It’s not Apple who does this, it’s the record labels. It’s pretty rare in my experience, though I have a couple of albums, or even tracks on albums, that are no longer available. You should always back up the content you buy from the iTunes Store, because there is a small chance that, for some reason, a record label or movie studio may remove some items from sale. Q: I canceled my Apple Music subscription, and it ends in a couple of weeks. But there are plenty of albums I want to buy. Is there an easy way to view music that was added by Apple Music but not purchased, so I can see what I will no longer have, and perhaps buy some of it? View this playlist to see which tracks in your iTunes library come from Apple Music. You can then check the playlist to see what you may want to buy. If you click the ... icon next to an album or track, you can choose Go To > Show > Song in iTunes Store, and buy it easily.